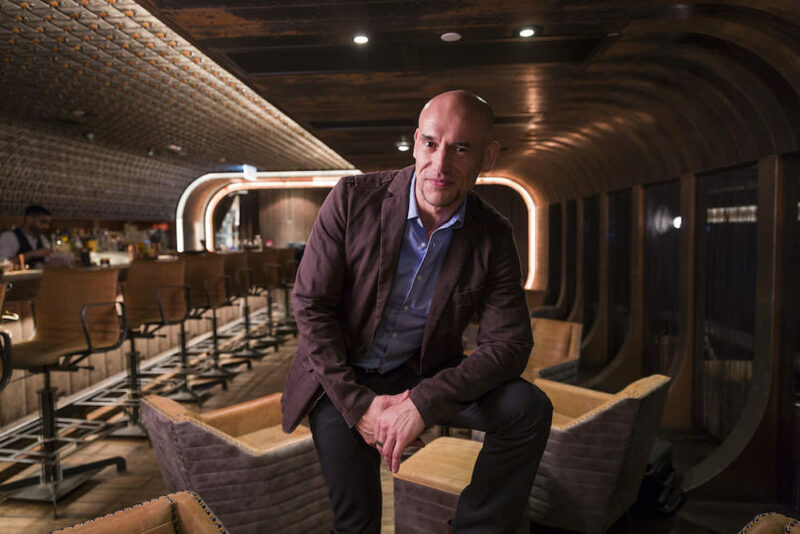 Joseph Boroski will be the first to tell you that Hong Kong’s bar scene is on the rise. In addition to his own eponymous, enigmatic cocktail enclave down a hidden alley off Hollywood Road, the venerated cocktail connoisseur points to the rise of niche bars such as mezcal haven COA, and the fact that a good daiquiri is never far away, as clear signs that Hong Kong now possesses some serious bartending talent. Being able to craft a perfect daiquiri — nailing that “perfect balance of sweet and sour”, he says — is in fact one of the litmus tests that Boroski uses to assess the skills of bartenders around the world, as he parachutes in and out of major cosmopolitan cities, expanding the registry of bars that have benefitted from his golden touch while adding to his ever-growing cocktail repertoire. 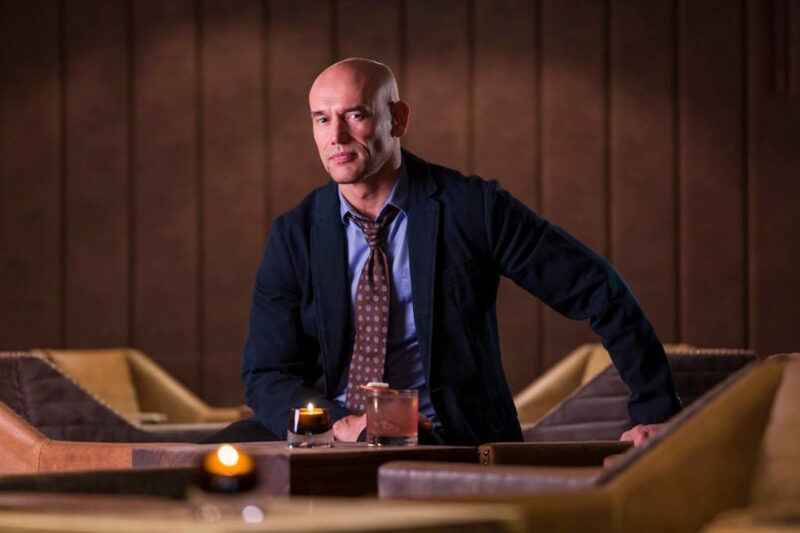 You may have never met the stylish, bald-headed bar maestro, but you may very well have tasted his drinks if you’ve ever propped up at a decent bar in New York or Bangkok: The self-proclaimed “mixsultant” has worked on the menus of countless bars (even he can’t ballpark the exact number), from high-end hotel bars to sleek speakeasies and everything in between. He also runs The Joseph Boroski Bar & Hospitality School, and always seems to have at least five rotating projects in the works. In the tornado of menu creations, masterclasses, and devising his own manual of cocktail “actions and methods” to train the next generation of mixologists, it’s a miracle that Boroski ever found a moment to open his own solo bar. After the success of the first J. Boroski, opened in Bangkok’s edgy Thonglor district in 2014, Boroski replicated his no-menu bar in Hong Kong a few years later with his local partners, Dining Concepts (Boroski has also collaborated on the menus at The Iron Fairies, Ophelia and Bizou). 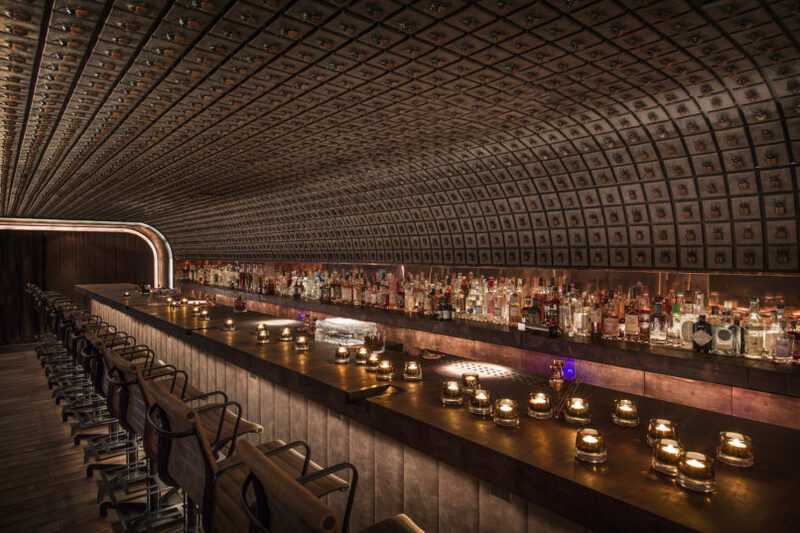 At J. Boroski, the captivating décor — with its mesmerising scarab beetle-lined ceiling, intimate atmosphere and customised ‘cocktail concierge’ experience — have resulted in one of Hong Kong’s most exciting bar openings in recent years. Three years in, the bar still buzzes with well-heeled patrons most nights, who watch as bartenders shake up bespoke cocktails crafted entirely based on their tastes, preferences and moods. 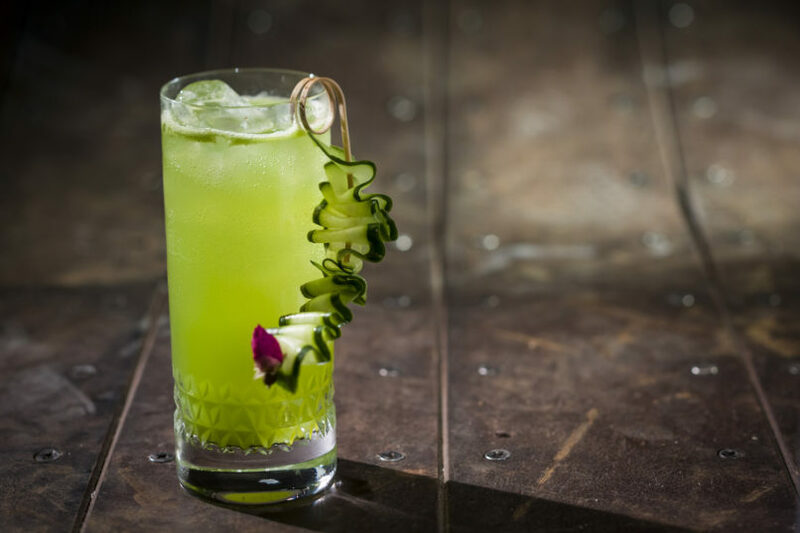 But you won’t find any theatrical tricks or over-the-top showmanship here: In the age of fancy Instagrammable tipples, Boroski insists that the focus remain on the quality of the drink itself, from the way the ice melts to the nuances of the spirits used and the subtle flavour differences a well-placed garnish can make. In town recently on another whirlwind trip to take stock of the shelves, the master mixsultant sat down with us to discuss cocktails do’s and dont’s, the trouble with “Instagram drinks”, and where cocktail culture is headed. 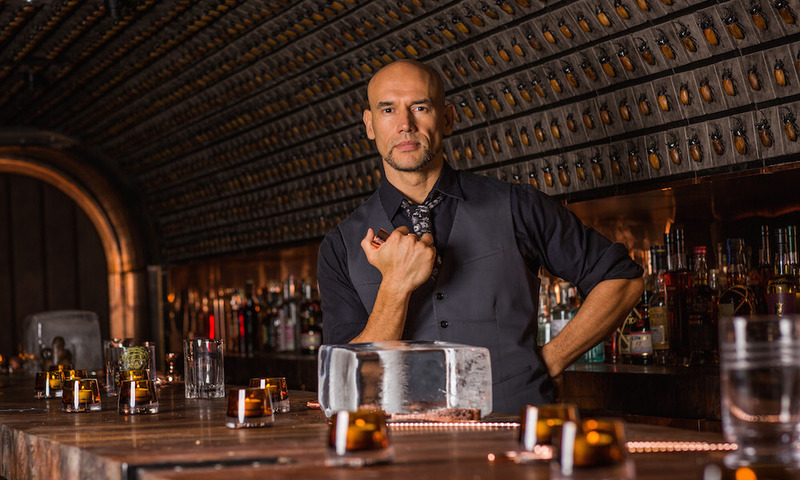 A self-proclaimed “mixsultant”, Joseph Boroski has worked on the menus of countless bars around the world. You're constantly jet-setting around the world. What brings you to Hong Kong this time? I try to come to Hong Kong once every few months or so for about a week just to work with the team. Lately I’ve been spending a lot of time in the U.S., but it always changes depending on what I’m working on. Every time I come back there’s always some things that we focus on. This time we’re really working with the guys on making sure we get to know the particular nuances of the spirits to create cocktails, figure out different ingredients that go well with those nuances, and whatever those subtleties happen to be. My base is in Bangkok, but I always have a handful of projects that are opening at any give time. I’m doing a few things in China for different hotel groups: I’ve been working with the Park Hyatt in Hangzhou, there’s also a Kempinski that’s going to be opening in the same city as well, and they’re doing a rooftop bar. There’s also an older hotel in Bangkok that’s going through a remodelling that’s going to be quite spectacular I think, and I’m doing some venues associated with that. Oh, and I’m also starting a podcast. I actually started it a while back before it was a cool thing, but then I was so busy… I wish I had done it back then. Everyone is like, “Oh, we’ll just record an hour of talking and that’ll be great,” but it’s much more work than that! Is it usually your responsibility to craft the whole menu or is it more of a collaboration? I always create the whole menu. The level of my involvement also depends on the project and what the client is interested in. I just did a venue in New York called The 18th Room, which is a highly sustainable cocktail bar. We’re using pretty much everything that comes in — we’ve set up a whole system where we’re recycling cardboard to make our own coasters, then giving all the bottle glass to local artisans to make stuff from it. So it’s very minimal, almost no waste. I just did that this past year, and basically the whole bar program was my concept. 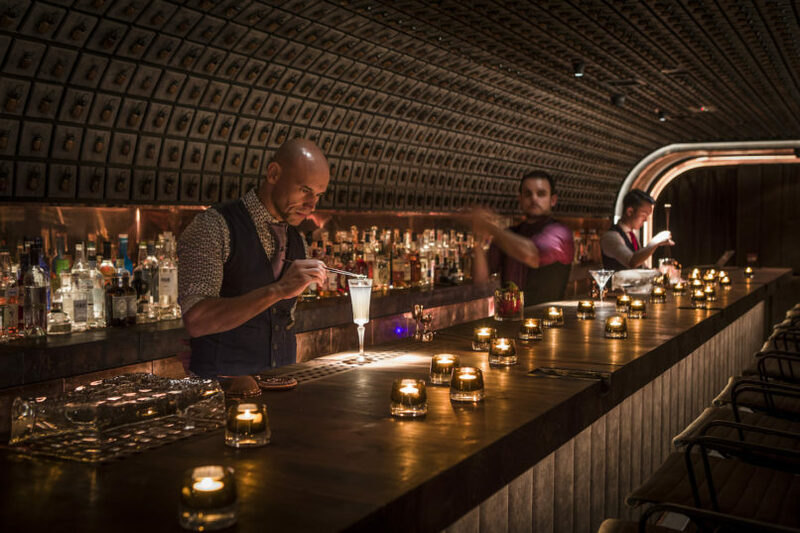 The 18th Room is New York’s newest sustainably-minded speakeasy. With so many projects, how do you ensure you're always bringing something original to the table? Take us through your process of creating. So I’ll give you a secret — one of my little fears is that at some point I’ll hit that wall where it’s like I don’t know what to do. Luckily I haven’t got there yet. I think one of the things that helps me is that I’m always taking notes and saving concepts and ideas for later use, so whenever I have a project I’m working on, I can refer to a lot of that stuff I’ve kept over time. But I think it’s just a matter of just being immersed in the industry and really seeing the trends that are going on. I’m very fortunate to be travelling so much and seeing so many different markets. So if you're creating a menu for a hot new bar in town, are you relying more on variations of the classics or your own creations? Again, it depends on what kind of direction we’re going in. I’d say there’s definitely now more of a focus on classic cocktails than, let’s say 10 years ago. A decade ago, people got caught up in trying newer stuff and I think it’s a little bit different now. Although variations on classics can actually go in very many directions, even doing a newer recipe it’s a good idea to grab a classic and modify it in some way because you have a standard that you’re working off of. You might not even realise it when you see it, but a lot of drinks are variations. In fact, it’s very difficult to make a drink that isn’t in some way a variation of another drink. What's something you're experimenting with at the moment? I have this concept for a bar, more specifically for the presentation of the bar and the actual way that it’s built, that’s going to completely change the way you’re presented with the drink. It’s so unique and different and requires so much of just like looking at the structure of the bar to the way the guest experiences it to the way the bartender presents it and everything. I love doing things like this that kind of stand out. That’s something I’m working on at the moment, but I can’t share the specifics yet! What about any new methods or techniques? Every time I do training work with the team or work with bartenders in any capacity, I always present everyone with a methods list. I call them “actions and methods”. And the way it’s set up is that anything you can do to an ingredient or part of a cocktail is listed on that actions list. It’s very rare actually that something new is added to that list, because new methods are really hard to come by. For techniques, one thing that’s really interesting is cocktail shaking over the years and the tools that are used, from 3-piece Bullet Shakers to Boston Shakers and full tin shakers. I’m always trying to see what kind of direction these tools are going in. For instance, I’ve been working with some 3-piece glass shakers — it looks like a Bullet Shaker, but it’s made out of glass. A lot of them are crystal and etched and the classic ones can be really nice, so I’ve been experimenting with those. How does that affect the drink? Metal is a conductor, so anything metal that has ice in it, the temperature from the outside is going to go very nearly instantly through the shaker into the ice. Glass is a better insulator from the outside, it’s a partial conductor and gets a lot of frost on it. So in training we’ll make a cocktail in a metal container and then we’ll do one in a glass container and notice the difference over time, that the ice will melt faster in metal and the cocktail will get warmer. What other trends are you noticing globally? For the past couple years there’s a been a movement towards draft cocktails, cocktails on tap. I think it’s a pretty cool idea from a business perspective because it doesn’t require the same amount of staffing and it’s very efficient, like ‘Boom it’s there!’ I’ve had some that are amazing and some that are definitely not amazing. It depends on what’s being used and the ingredients. Also I think barrel-aged cocktails have been declining in fashion — you still see it in bars but maybe not as much as you used to, and places like New York have not been doing that so much. 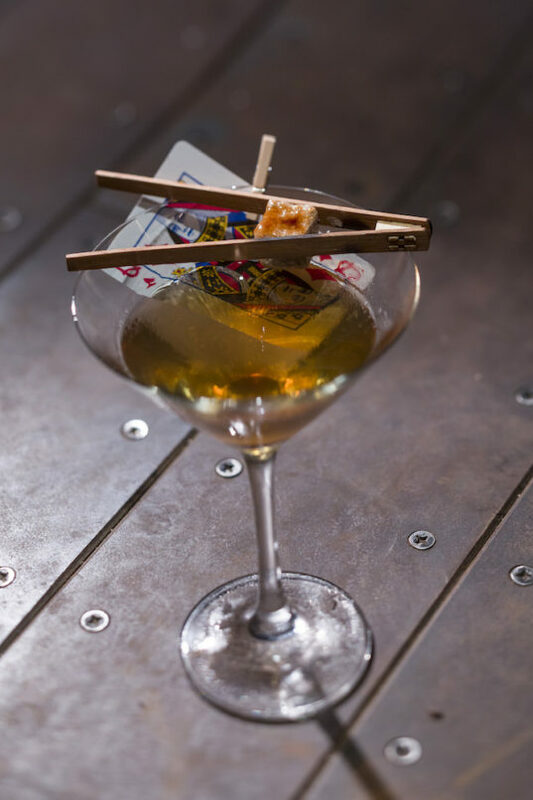 The “Luck Be A Lady”, one of Boroski’s signature bespoke cocktails. Do you think Hong Kong largely draws its drink trends from New York? I think there are so many influences from all over in New York. If you look at the top bars there, there’s bartenders from all over the world — from Japan to Australian to Ireland to the UK. It’s not that Hong Kong doesn’t have that, either, but I think that just the initial bar awards and the initial interests, a lot of that comes from New York and just the fact that the place is so important in cocktail history. So many cocktails originated there. But just over the last couple of years, Hong Kong has evolved very quickly, much faster than I’ve ever seen it evolve in New York. I remember when I was first working in Hong Kong, like a dozen years ago, there weren’t many staples here, especially with cocktail bars. Sure, there were some bars that were pumping drinks out and stuff, but there’s definitely a lot more really good bars in the city now. I love what people are doing here. There’s some really great bartenders and concepts that are being developed. And the thing about it that I love also is that there are a lot of places that are more narrow in their focus — and that’s really what makes places stand out. 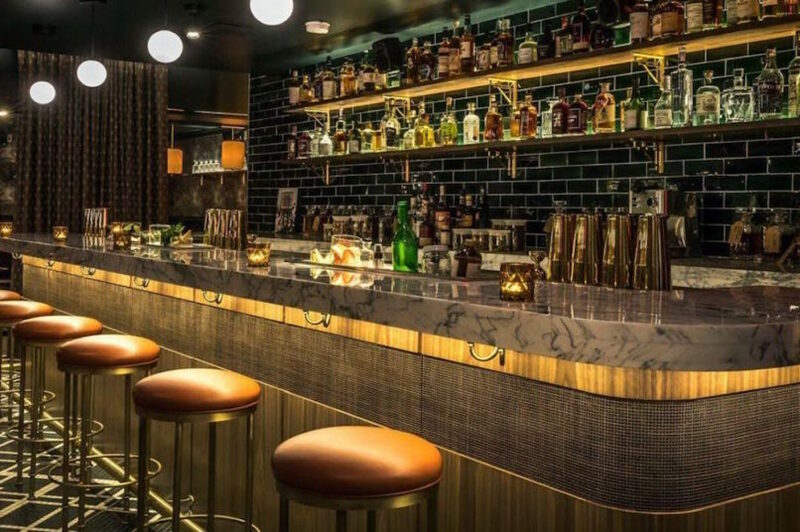 When you first opened J. Boroski in 2016 as a no-menu bar, were you apprehensive that it might not work, or that Hong Kong drinkers wouldn't appreciate it yet? No, I knew it would work. I don’t mean to be so cocky about it, but I knew it. I knew Hong Kong. I had been coming here for many years, and did projects here and worked with a few places like Mandarin Oriental, so I knew what was going on. And I also knew what the market was kind of lacking, and maybe I didn’t know exactly where it would be on the market, but I knew there would definitely be people that would want this kind of idea, that would enjoy being here. J. Boroski’s mesmerising scarab beetle-lined interior reflects Boroski’s passion for science and entomology. Was it the first bar serving up custom-made drinks in that fashion? As far as I know. Originally with J. Boroski in Bangkok, that was an accident actually. I just invited some friends and I took my most advanced students and they became my bartenders. I said, “OK, we don’t have a menu yet, we’re just going to ask people what they want and use the ingredients that we have currently and let’s see how it goes”. So they invited their friends and that’s how the place grew. I never officially opened the place; it just grew from there. When I finally did do my menu, I had all these cocktails from all over the world that I had created. It was highly prepped and super curated and I was really proud of it. I thought that it was going to be the best menu ever, and it turned out no one wanted to order off the menu because they knew that you could just order whatever you wanted. How do you train your bartenders at J. Boroski? Do they get a list of recipes for drinks you’ve created? There’s a database that we use so they can reference things. But the idea is that, you know, I’ve never repeated a drink at J. Boroski — not even for the same person who said, “I want this again”. I’ll do it but make it slightly different. And sometimes they like the first one, and sometimes they like the second one, but that’s the idea. All these other places that I’ve ever worked on, consistency is the main thing — making sure that the drinks come out the same, no matter who makes it, what time of day it is. I’ve scrapped that at J. Boroski. I said I want consistency to go out the window, because we’re going to be making drinks that are entirely custom-made for people and unique. Having travelled all over the world and visited bars in different places, what's one thing you would like to banish? I’d be happy to not see like stacked-up drinks on fire and things like that. Someone showed me this video recently of this guy making a cocktail with this crushed ice that fell and there was fire involved and all these other things. It was a very unique idea, but I could tell it was a horrible drink just because of the way it was made. But it wasn’t about the drinks, it was just about the performance. Which is a weird element isn’t it? Some people ultimately don’t care. I mean, I’ll have people that say, ‘Just make me something that looks good on Instagram’. People will literally come in and ask for that. J. Boroski specialises in bespoke cocktails customised based on a customer’s tastes, preferences and mood. If you could guide the industry in the next five or 10 years, where would you want to see it headed? A lot of bartenders lean towards classic or modern, but I actually like to mix both. I see an important element to making sure that there are new trends and things like that, but on the other hand, you have to respect where we came from and what we’re building upon, so I hope that mix doesn’t go away. Sustainability also is really big, and I do think in the next couple of years the majority of bars will implement sustainable measures, because the guest is going to demand it. You see a lot of bars banishing plastic straws these days. I mean, that’s kind of like a teaser showing that people are interested. But in itself it does every little compared to everything else people are tossing out — it’s not even a drop in the bucket. But’s hopefully a premonition of what’s to come. I do think that people are going to start demanding sustainability. An interesting thing that goes along with it is garnish… asking “What can we do with this? Maybe we can make it like a garnish”. Take mango skins, for instance: a lot of dehydrated mango skins are actually really nice as a garnish and you might throw them out, but they actually taste amazing and make a crisp little snack. If you had to choose your three favourite drinks, what would they be? That answer is dependent on where I am, who I’m with, what time of year it is, who my bartender is, what the selection of spirits are at the bar, how their quality of ice it, etc. But the second part of that answer is that I do have little litmus tests that I use. So if I visit a place and I want to see what they’re capable of, I’ll ask for a daiquiri. It’s a great, great classic cocktail. Very simple and if it’s done well, properly — it’s going to be one of the best cocktails. That’s actually what my podcast is about — talking to bartenders all over the world about the daiquiri. Most good bartenders will agree with me. You have to nail that balance of sweet and sour, of using fresh ingredients. Are you using lime that’s just squeezed and is chilled? What’s the particular rum? The length of the shake? If it’s not long enough, it won’t be cold enough and if it’s too long it’s going to be diluted. An old fashioned is another really good one for a spirit-forward cocktail. The drink has a really interesting history, in fact, it was the first cocktail in print to be called a cocktail. So it’s kind of gone in a lot of different directions, from crushed fruit in the drink to soda to using lemon twist or orange twists. Sometimes you see people crush a sugar cube or they’ll add syrup… because of that interesting history you see classic cocktail books with different recipes that reflect this history over time. There’s a lot of variations that I think are acceptable, but there are those that I just have a hard time accepting. The worst is like a really sweet old fashioned. I would love if all bartenders knew to always lean towards a dryer rather than sweeter old fashioned. Finally, any future plans in Hong Kong? With Dining Concepts, they’re always opening new spots and we’ve been working together for many years, so doing another bar is always a possibility. I’m not sure I’m allowed to say, but yeah I can hint safely I think that there’s always stuff coming up. And if it’s going to bring me back to Hong Kong more, I’m happy.